The New Portable Folding Holder Multi-stand designed to provide you with a safe and secure mount for your iPod touch, iPad, Smartphone and Cell Phone. This New Portable Folding Holder Multi-stand makes your iPod touch, iPad, Smartphone and Cell Phone at an easy-to-read angle. Durability and protection, this New Portable Folding Holder Multi-stand is designed to stand your iPod touch, iPad, Smartphone and Cell Phone at the perfect angle, allowing you to watch movies, view photos or type in a more comfortable position. 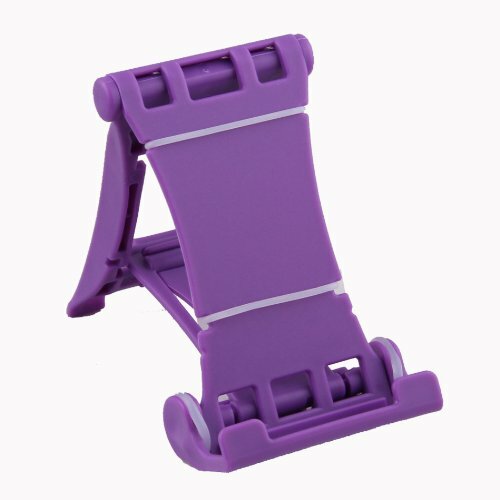 This New Portable Folding Holder Multi-stand is so perfect for your iPod touch/iPad, just get yours before they are gone! Universal for Kindle & any models of E-readers (not included). This is the greatest little phone and tablet holder This is the greatest little phone and tablet holder, i was just wondering if i could design and market something like this when i discovered this one! As described. As wanted. This is exactly what I wanted for my Galaxy s4. After failing to find a kickstand case that offered protection and dual angle kickstand use, I decided it was best to simply get a compact stand.This is exactly that. Compact. Easy to open. Stable. Comfortably fits my phone in the case vertically and horizontally.The color is bright (but not neon) so it will be easy to find in my purse.I recommend this to others. purple desk stand They work great just what i needed! They work with several of my other devices so they do not fall or go anywhere.